Sound preconditioning induces HSPs without causing permanent hearing loss. Mice were exposed to sound preconditioning (8–16 kHz octave band of noise at 90 dB SPL) for 2 hours. (A) Hearing thresholds were measured by ABR. Twenty-four hours after sound exposure, mice had mean TTSs of 9 to 22 dB. Hearing sensitivity returned to pretest levels by 1 week after sound exposure. Asterisks indicate significance between the pretest and 24-hour post-test ABR thresholds (ANOVA, *P < 0.05). (B) Sound exposure did not cause any change in the amplitude of ABR wave I. (C) Cochleas from sound-treated and control mice were collected at 2, 4, 8, and 12 hours after sound exposure. Sound caused the induction of Hsp32 and Hsp70 mRNA in cochleas of sound-treated mice relative to those of untreated (control) mice. Asterisks indicate a significant increase in Hsp mRNA relative to control. (D) Hsp70 induction in response to sound was restricted to the cochlea. Tissues were collected from control and sound-exposed mice 8 hours after sound exposure. 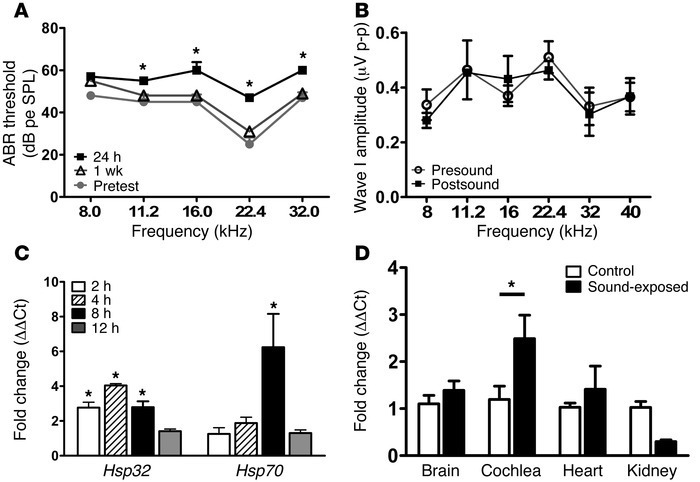 Sound exposure induced Hsp70 mRNA in cochlea but not in brain, heart, or kidney. Asterisk indicates a significant increase in Hsp70 mRNA relative to control. Data shown are the means ± SEM.